Its not every day that chefs are presented with the opportunity to exercise their dreams of owning their own restaurant. Brian's journey as a chef dates back to 2006 when he first was offered the position of sushi chef at the Japanese restaurant he worked for. He was young and eager to learn a form of art that requires a vast (or lifetime) supply of patience. Luckily for Brian, he has and still possesses an unfathomable amount of patience. With over 12 years of experience as a chef, Brian's philosophy in the importance of providing quality food has not changed. To this day he still takes the lead when it comes to deciding on vendors and when it comes to the ingredients we purchase. Brian plays the biggest part in the Company's ability to maintain and provide quality food. Meet Hooked on Sushi Encinitas Executive Chef Daniel! 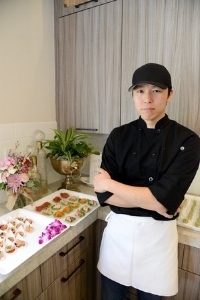 Chef Daniel is one of the founding members of Hooked on Sushi. Chef Daniel was taught by Owner-Chef Brian. With over 6 years of sushi experience, Chef Daniel is "sensei" (teacher) to our Junior Chefs, and "NFL fanatic" to our customers. If you want to strike a conversation with Chef Daniel, ask him about his tattoos. Chef Daniel brings to our organization a bright and ambitious personality with the desire to push through and provide a work of art that each customer can deliciously enjoy. Meet Hooked on Sushi Carlsbad Executive Chef Carlos. Chef Carlos is the mastermind behind some of our customer's favorite rolls such as the Hooked on Sushi Roll and Mexican's Gone Wild Roll. With over 18 years of sushi experience, Chef Carlos brings his "Mr. Miyagi" like expertise to our restaurant. Chef Carlos enjoys integrating non-traditional sushi items such as cilantro and lime with more traditional ingredients such as maguro and aji. Chef Carlos is meticulous in his work of art, and is devoted to providing good quality products to our customers.